It’s Mother’s Day and I am remembering my mom and thinking about all the many mom’s I love – sister, DIL, SILs, and many friends – Happy Mother’s Day to you all! One of the things that I know for a fact, is that Mom’s are very busy people. Most Mom’s are tirelessly trying to do the right thing for their family all the time. Just as the members of our CSA are doing by feeding their family the freshest, healthiest organic food possible. Yellow Stonehouse Farm tries to do our part to support Mom’s and families. We do this by offering different membership options and pick-up days, and then match that with flexibility to make reasonable changes for vacations and conflicts. The Every-Week Full CSA farm-share begins in June and lasts through October. It is the traditional weekly pick-up of freshly picked vegetables and farm fruits, sized to feed a family of four. This option is $650 for a season of USDA certified organic vegetables plus weekly PYO privileges. 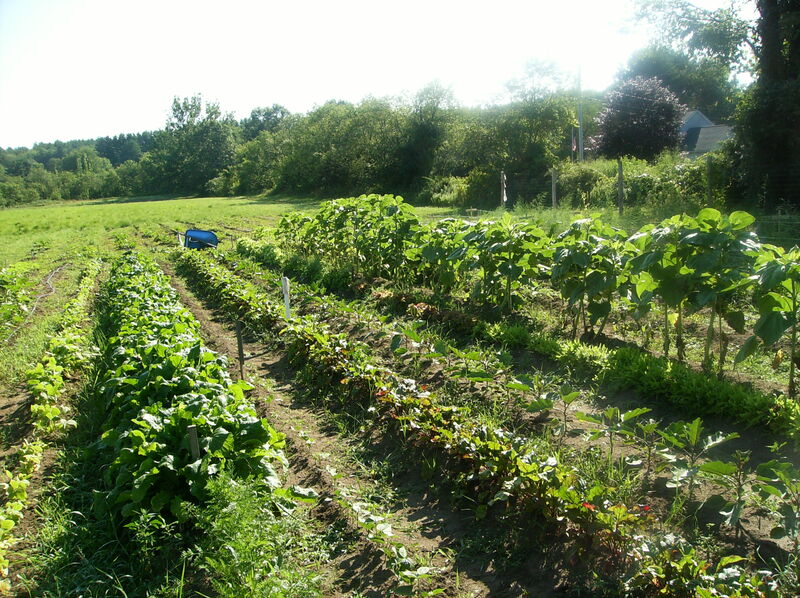 The Every-Other Week Full CSA farm-share begins in June and lasts through October. Members pick-up of freshly picked vegetables and farm fruits every other week, each share sized to feed a family of four. 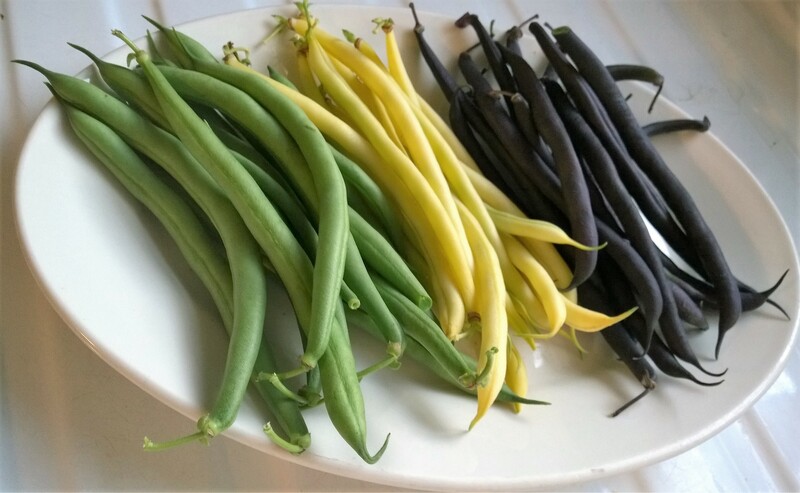 The EOW share is perfect for singles, couples, or families with one child and works because the vegetables are so fresh they last the two weeks. The PYO option enables EOW members to pick vegetables every week so they can augment their share if desired. This share also cuts the number of trips to pick-up at the farm in half, saving time and money. This option is $450 for the season for USDA certified organic vegetables plus weekly PYO privileges. The Sharing-a-Share option is available for both the Every-Week CSA farm share and the EOW CSA farm share. There is a small upcharge to share, as we increase the quantities of some vegetables to allow the easy splitting up of the veggies. For example, if we are giving out a single cabbage or watermelon, an item not easily split, we will round up the number to two, so that both sharers get an entire cabbage without having to divide or cut the vegetable in half. Like-wise, if we are giving out three tomatoes, we will round up the number to four, making sure that each sharer gets two. The up-charge for Sharing the Every-Week farm share is $110.00, making the CSA cost for each sharer $380.00. The up-charge for the EOW share is $55.00, making the CSA cost for each sharer $252.50. Many larger families and groups – those with 3-5 children or group homes – will also buy an augmented share to increase the quantity of produce in their share. Weekdays Wednesdays, Thursdays, and Fridays from 3:00 – 6:30 pm. These weekday timeslots work for pick-up’s after soccer or gymnastics or before t-ball, softball or baseball practice; it also works for the parent on their way home after work. And don’t worry, if something comes up or you have a conflict, you can send us an email – hopefully 24 hours in advance – to let us know you need to reschedule to another day. Saturday from 9:00 am to 1:00 pm. This weekend timeslot is often used by families who are coming to the farm as an excursion, picking vegetables, visiting with the farmers, or walking their dogs around the perimeter of the fields on deer patrol. And if you can’t make it that day, are going on vacation for a week and want to pick up your vegetables early to take along with you, we will be happy to accommodate you – hopefully with 24 hour notice. Pick-Your-Own days and times are Tuesday through Saturday 9:00 am to 6:30 pm. Payment Plan – YSF farm has a three payment plan to make the CSA farm share more affordable. 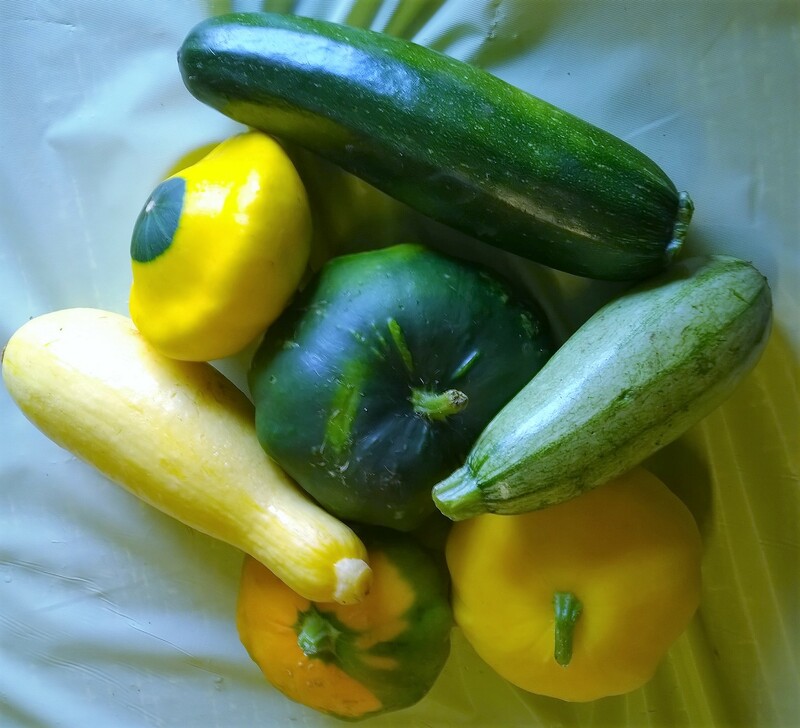 Yellow Stonehouse Farm wants to be your organic community vegetable farm – and we believe that providing customers with flexibility and convenience is one way to make it easier and more enjoyable to join. Hopefully, one of these options will work for you. Due to the increased number of new members that have signed up for the 2018 season, we have modestly increased the number of shares available. Therefore, we now have a few more 2018 CSA farm-shares available for sign-up. CSA pick-ups are Wed., Thur., and Fri. from 3 – 6:30 pm and Saturdays from 9 am – 1:00 pm – so sign up soon. We are having our annual Open Farm Day on Saturday May 19th from 10:00 am to 2:00 pm and you are all invited. Please sign-up at the event listing on our Facebook Page or for more information email us at yellowstonehousefarmcsa@gmail.com. One would think that during the winter months, John and I would be relaxing and recharging our batteries. Well, to be honest, there is a certain amount of that – we do relish our snow days when we are “forced” to stay put and cuddle up with a good book and cup of hot chocolate. This time of year we also attend to small domestic repairs and projects that make life better, but which get neglected during the busy growing months. This winter’s projects included replacing the kitchen faucet, installing new bead board around the shower, and getting the light over the kitchen sink repaired. We also spend some time getting out into the community to talk about our farm, the CSA and why we are Organic Farmers. I had a wonderful experience yesterday with one such group, The Ramapogue Women’s Club of West Springfield. They are a group of lovely women from all around West Springfield, dedicated to raising money for academic scholarships for West Springfield graduating seniors. I gave a talk that covered CSAs, Growing Organically and some of the reasons why John & I think Organic Food is good for you. Here are a few slides from the presentation I gave. It was an active and interesting group – and very flattering to receive such an enthusiastic response. Here’s another slide which they all found interesting! 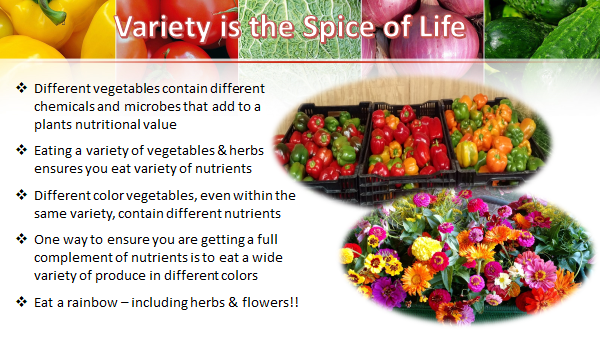 The idea of eating different colored foods to ensure you are getting enough vitamins was one trick everyone seemed to like. 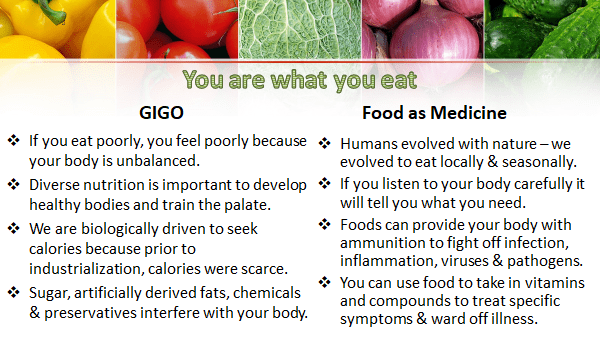 And we all had fun with the concept of “You are what you eat” and “Food as Medicine” two concepts I plan to dedicate a lot time and thought to in the coming months. If you or your group are interested in having Yellow Stonehouse Farm come talk to your group, club or school please contact us by email at yellowstonehousefarmcsa@gmail.com or call us at 413-562-2164. Looking out the window in the middle of March 2017 – this is what we see … a beautiful snowy day at the farm. But it’s almost Spring, the days are lasting longer and we are dreaming of warmer days and the farm’s first early vegetables – asparagus, peas, young lettuces and tender radishes. After the carb fest called Saint Patrick’s day (so tasty as our bodies crave carbs this time of year) we yearn for fresh vegetables and are frustrated; they aren’t especially fresh having been trucked in from Florida and Georgia and then sitting on grocery shelves a little too long. We’re hoping those of you who were members last year, managed to get a few items in your freezer to remind you of the deliciousness of farm fresh organic produce. I know when John and I open a container of my homemade garlic scape pesto or squash, pepper and tomato soup base we are transported back to the warmth & sunshine of last summer. Healthy eating is a big benefit of CSA membership in our USDA certified organic farm and a primary reason for the creation of our CSA five years ago. We wanted to share farm fresh organic food with the local community. CSA means Community Supported Agriculture. Shareholders join before the start of the season so farmers can plan what & how much to grow – ordering seeds is a big project as there are many choices, and it helps with the cost of seeds and labor to get the season started. CSA members are later rewarded with the fruits, vegetables, herbs and flowers of our labor. Our CSA is set up to run for 20 weeks beginning the week of June 7, 2017 (weather permitting) and ending in October. Two options are available – an Every Week Share for $650 and an Every Other Week Share for $450.00. Members pick up their share at the on-farm market style distribution area, where that week’s produce, picked fresh for them at the peak of ripeness, is arrayed in bins for shareholders to select from. Each week’s produce is accompanied by recipes, nutritional information and preparation suggestions customized to that week’s unique share. An added bonus are Pick-Your-Own crops such as peas, cherry tomatoes and beans not to mention the beautiful flowers and aromatic herbs included with every CSA membership. We carefully balance each weekly share to provide a variety of vegetables and field fruits to support a healthy diet for you and your family. You’ll receive coveted items such as asparagus, strawberries and rhubarb, corn, garlic scapes, delicate lettuces, juicy melons and a myriad of tomatoes. If you receive too much in one week, you can always freeze or can it for that distant winter day when you’re craving a summer treat. You can elect to “share” a share with another family. See details on shareholder application. If you cannot pick up your share, you can make arrangements to pick up at another time or have someone else pick up for you — if you send us an email a few days in advance. Stay warm and Happy Spring. I know that’s a contradiction … do enjoy this picture of Spring daffodils. 1. 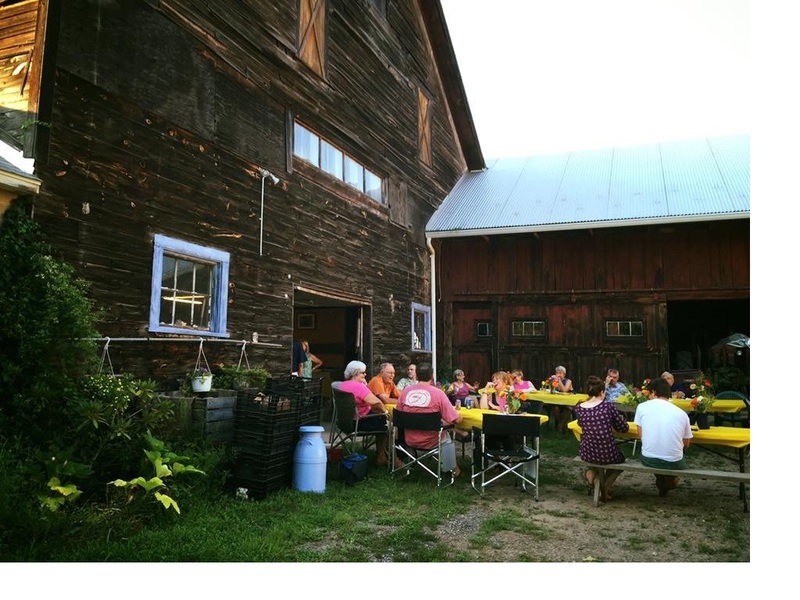 CSAs connect consumers to local farmers and fresh food CSAs or Consumer Supported Agriculture, is a model for connecting consumers to local farms, originally started in nearby Great Barrington, MA in the 1980’s. 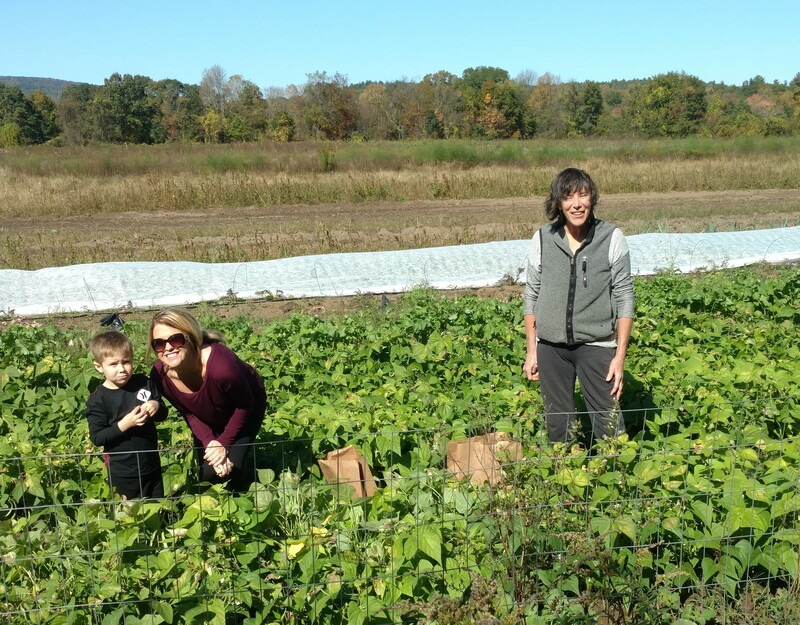 CSAs offer consumers the opportunity to become shareholders in their local farm; in turn, the farm provides fresh, locally grown – and in Yellow Stonehouse Farm’s case – organic vegetables, in exchange for your membership. 2. CSAs are thrifty Yellow Stonehouse Farm’s CSA is a very good value. For about the price of dinner for two, or $33 a week, you receive a generous amount of organic produce of the highest quality, nutrition, and freshest flavor. Buying directly from the farm, instead of the grocer, skips the middleman, and gets you a better deal. Yellow Stonehouse Farm is also an all-inclusive CSA – your membership entitles you a vegetable share plus access to the farm’s extensive cutting gardens, popular pick-your-own vegetable patches plus access to the back acreages extensive walking trails and picnic areas. 3. CSAs are healthy Joining a CSA improves your health by adding vegetable nutrition to your family’s diet on a consistent basis – plus cooking fresh vegetables eliminates many of the additives and extra ingredients of processed food. Locally grown vegetables are fresher and retain their nutrients versus produce transported thousands of miles. 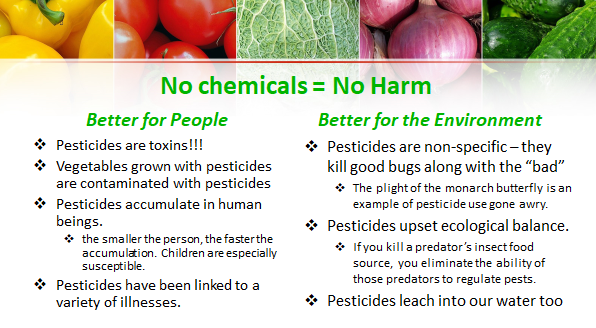 Organic farmers don’t use pesticides and chemical fertilizers, not to mention organic food tastes better and has more nutrients since they are grown in healthy soils. 4. CSAs are friendly Perhaps one of the best things about joining a CSA is the wonderful community you become a member of – sharing a love of food, nature, and cooking. 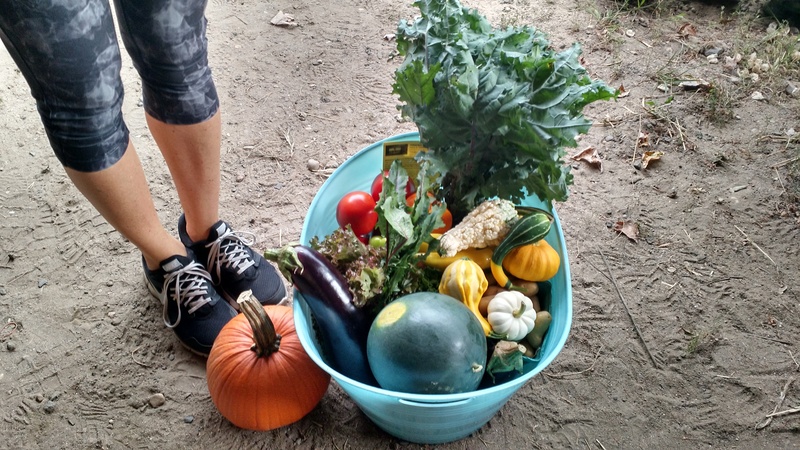 Belonging to Yellow Stonehouse Farm’s CSA is fun! 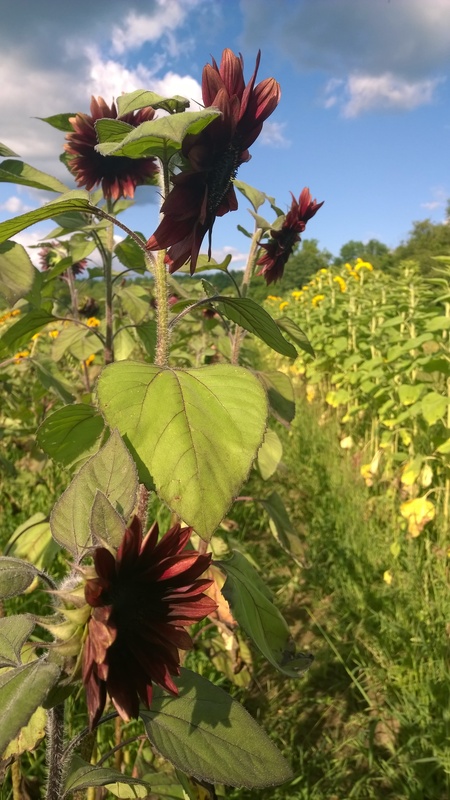 We encourage everyone to engage with the farm by picking vegetables and flowers and experiencing the beauty of nature; we have community events such as potlucks and harvest celebrations; we have members who are photographers, bird watchers, herbalists and walkers; experienced cooks and those who are just learning. You’ll get delicious recipes to prepare your vegetables and you’ll get to know your farmer’s face to face, who are happy to see you and to answer any questions you may have. 5. CSAs are green Community supported agriculture encourages non-polluting farming practices such as organic growing methods. This type of farming also minimizes food waste by producing just the amount of food members need, with minimal unused surplus – and any surplus we have is donated to charitable food pantries and kitchens. Supporting your local farm also helps to conserve the land, agricultural heritage and beautiful natural resources of a historic farming legacy in Westfield. 6. CSAs are a win-win For both CSA members and farmers! As a shareholder, members are entitled to a wide variety of nutritious, freshly picked vegetables over an extended season (June – October) at an affordable price. For the farmer, knowing how many people to grow for permits efficient planning, seed ordering and harvest scheduling. All of this helps sustain the farm as an agricultural enterprise so that future generations will also be able to enjoy fresh, locally grown food! John and I just finished the first 2017 share distribution consisting of many root vegetables plus several recipes. 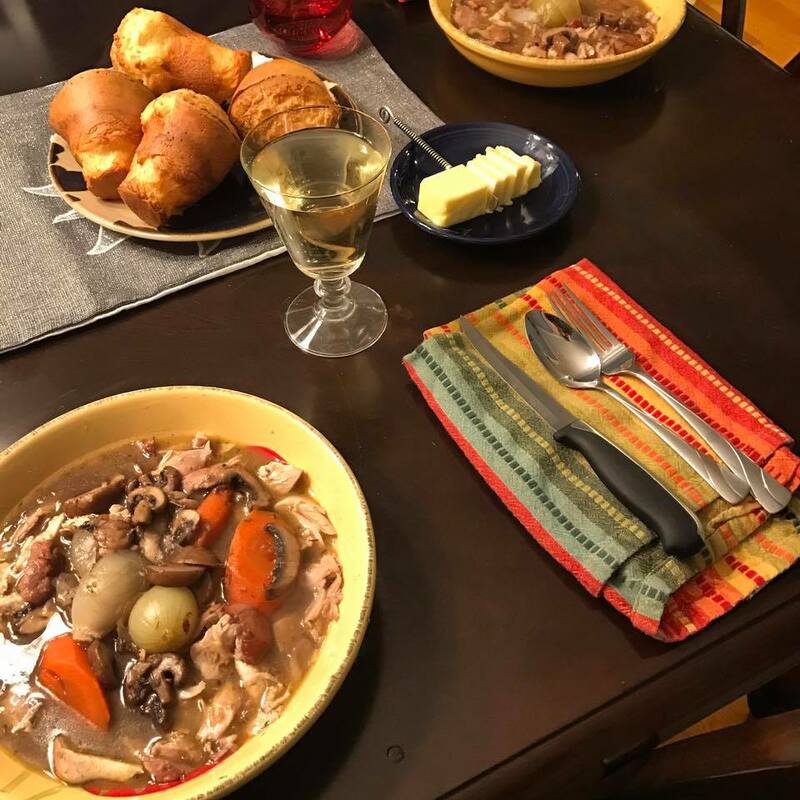 A Yellow Stonehouse Farm CSA member, Melissa, made my coq aux vin recipe & posted a terrific picture of the dish on our Facebook page – see picture left. We are lucky – our CSA has many supporters & involved members – which brings me to our farm goals for 2017. The foundation of our farm goals for 2017 is gratitude – which we will express by showing gratitude and returning kindness to members and supporters. We have much to be thankful for and will keep this top of mind in 2017 – and demonstrate by doubling down on appreciation for our members! 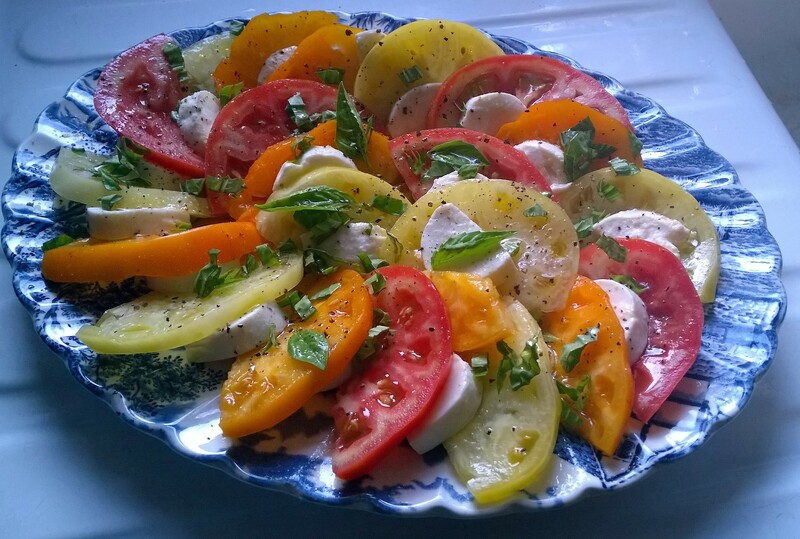 So – Melissa, thank you for making the recipe and sharing it with us. We also are excited and thankful to the Massachusetts Department of Agricultural Resources (MDAP) for awarding us a matching enterprise grant of $10,000 for barn repairs and improvements. Not only are they helping us repair our 1840’s timber built barn, they are providing us with technical farm planning assistance. Food trends are important to us so we were fascinated to see 2017 being touted as “vegetable-centric” and featured by many chefs, restaurants and cookbooks. Multi-colored vegetables are a big trend, with radishes usurping kale as the new favorite and squashes becoming the new favorite staple! All reasons for us to feel rather smug as last summer we anticipated these trends by growing many radishes, lots of colored vegetables and many types of squash – which we plan to duplicate in 2017! Two more 2017 themes are Nourish and Nurture — realized through recipes encouraging health & wellness through food & herbalism. This is a labor of love, combining many interests and simultaneously enhancing the membership experience for the farm’s shareholders. We’re going to provide seasonal herbs as well along with information on health benefits and daily use as part of a healthy diet. As an organic farm, we’re environmentally focused, and realize 2016’s drought was partly a result of the changing climate. In response, we have decided to become advocates for the protection of a scarce and precious resource – water. We are fortunate to have ample and accessible water – however, this can change anytime – so we’ll assert ourselves as stewards of these vulnerable resources. 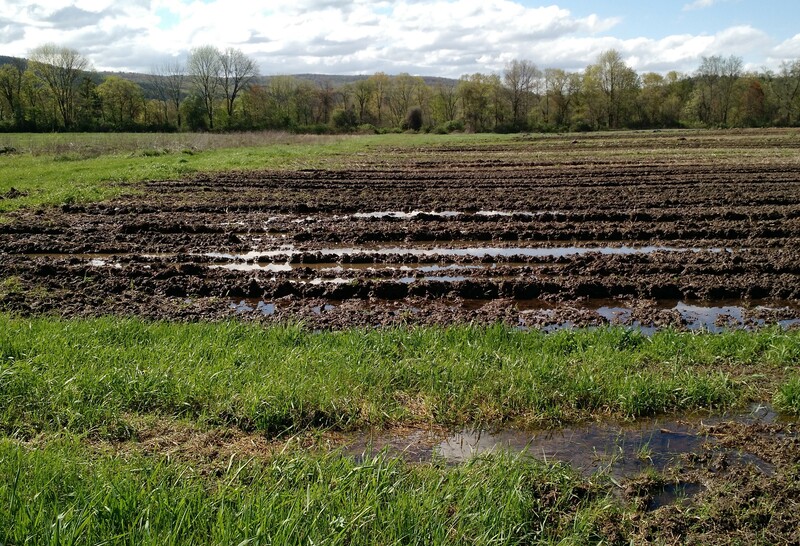 Westfield’s own water troubles are a red flag and we will be vigilant to protect the farm against contamination, pollution and climate impacts. New research shows that organic farming – through crop diversity, cover cropping and low till practices – is one of the best ways agriculture can counter lack of rainfall versus monoculture’s susceptibility to drought. We will continue learning best practices to ensure our crops stay bountiful, delicious and healthy – despite droughts and other adverse conditions. And because we take our job of providing local organic food to our neighbors and members seriously, we plan to implement new ways of providing vegetables to more CSA members in 2017. Finally, we pledge to share our farm – and the chance to relax and enjoy the lovely fields, hills and dales, smell the newly turned soil and mowed grass, watch the bees, birds & butterflies, revel in the beauty of the flowers, grasses and trees, and taste a freshly picked tomato or snap pea. We invite you to slow down and be mindful of the miracle of our planet, the farm’s place on it and how wonderfully amazing nature is. 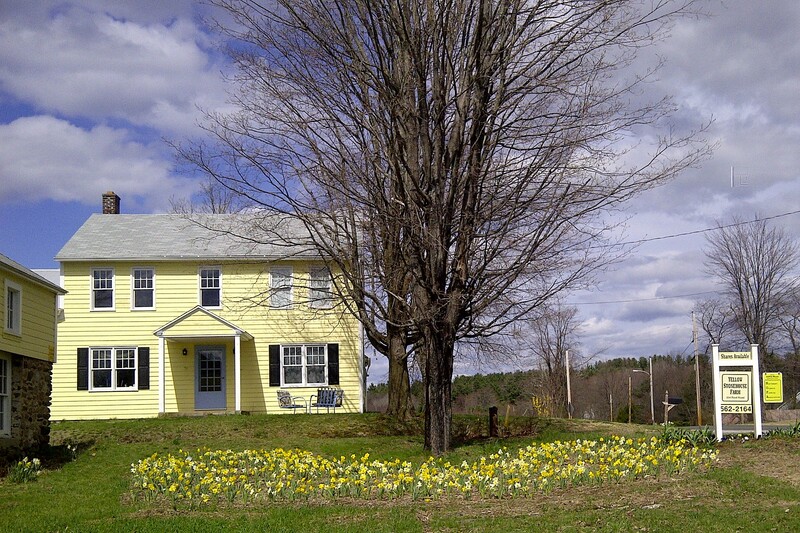 Practicing mindfulness – being aware of your thoughts, emotions, & experiences on a moment-to-moment basis – is something you can do anywhere, but we invite you to do so here, at Yellow Stonehouse Farm. John and I just finished distributing this year’s Thanksgiving Feast. It’s such fun to hand out tons of produce and watch a member’s face light up she sees her favorite squash or root vegetable in the bins. This year we were very fortunate to be able to provide 18 different items – everything from acorn squash, apples, yellow & boiling onions (gotta love those creamed onions), HUGE butternut squash, Brussel’s sprouts, carrots, cranberries, garlic, horseradish, parsnips, shallots, sweet potatoes and turnips! 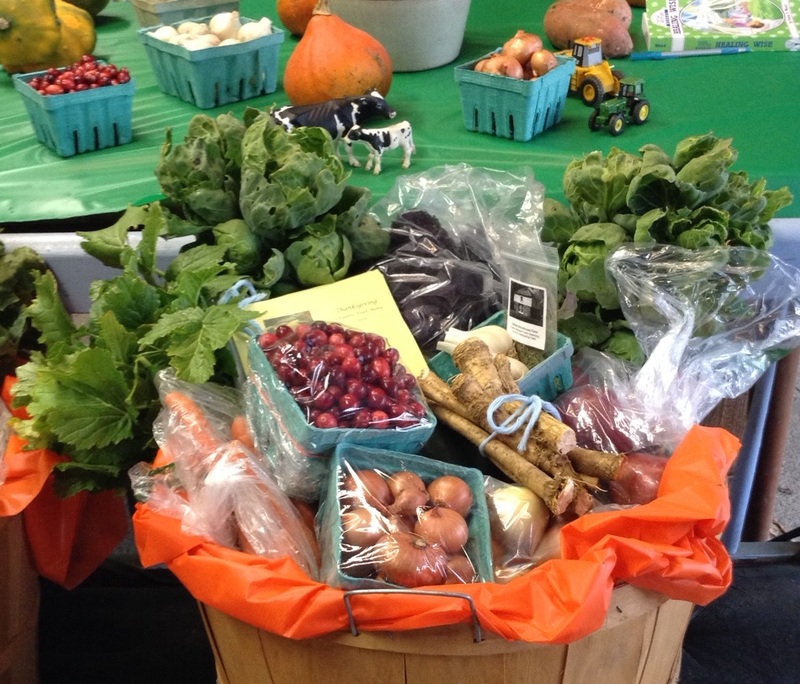 We also sold Thanksgiving feast baskets to a few new farm friends – who seemed very happy with their basket’s variety & amount of vegetables as well as the special touches like YSF’s special Thanksgiving book of twelve recipes, YSF’s custom poultry seasoning, and the heirloom Howe’s cranberries. Here’s a picture of the basket we gave out. We are thankful to farm beautiful, fertile land blessed with abundant water. We are thankful we could successfully sow & reap an abundance of vegetables this summer despite the drought. We are thankful that John’s family were such great stewards of the farm. They made sure the farm continued as an agricultural enterprise and not developed, a practice we are privileged to continue today. We are thankful for the children who come to the farm – it is a delight to positively impact the next generation. We love the adorable antics of babies & children, which is surely helping to keep us young. We are thankful to have settled full-time on the farm – where we are engaged & productive; continuously learning new things while giving back to our community – all things that give meaning to our lives. We are thankful to have so many wonderful members of the farm, who share their pleasure in the farm with us and make our work so rewarding. Your membership is what makes this all work. Today is Halloween – amazing what a big event it’s become. It’s a great excuse to dress up as your favorite character – whether it’s a super hero or future vocation. I expect we’ll see a few of each tonight – superman, wonder woman, fireman, ballerina, various celebrities and sports figures. And it’s not just the kids who get into dressing up – as I can attest to after attending a costume party last weekend and dressing up as a 1920’s flapper – great fun! 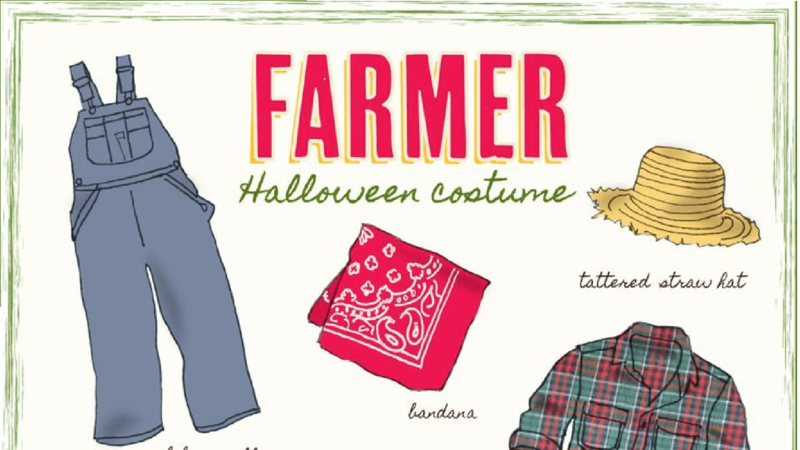 What I don’t expect to see is a child dressed up as a farmer – much to my sorrow. I don’t know many kids today who want to be a farmer when they grow up – or parents who chose farming as a career for their children. This is a problem for us all – especially in New England where we are losing our family farms at an alarming rate. If the farms disappear and there aren’t any new, young farmers who want to get into the business – who is going to grow our food in the future? One of the major barriers to entering farming, is the cost of acquiring the farm. Very low commodity prices also make it hard to earn a decent living to support a family on farms less than 1000 acres. Not to mention the physical hard work farming requires – not attractive to many nowadays – though our physical health might benefit. A more recent problem is the industrialization of farming dependent on expensive chemicals and GMO seed that lock farmers into methods of farming susceptible to plant diseases and invasive insects. 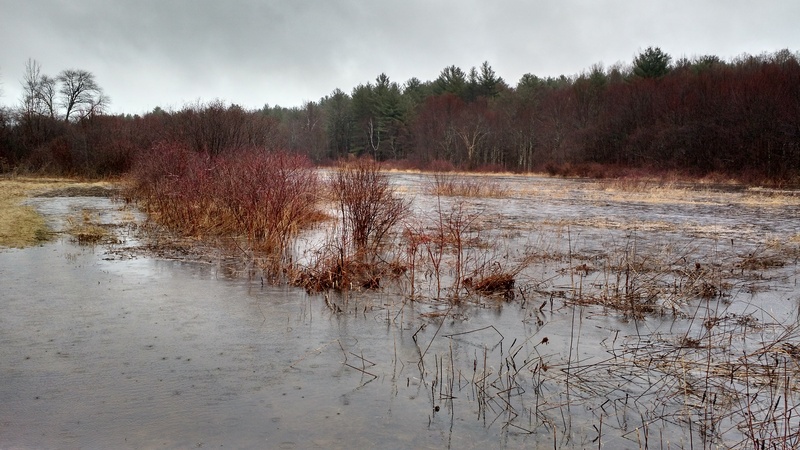 Changing weather patterns make our lovely temperate New England climate dryer and hotter – increasing the risk and cost of farming even more, and pushing more farmers out of business. A positive farming trend is the growth of CSA’s (Community Supported Agriculture) which connects community members and local farms. 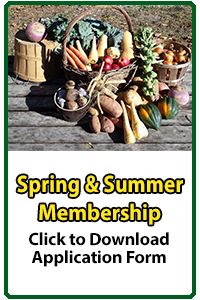 Community members buy shares in their local farm for a set price and then enjoy the bounty of the farm for a season: The Summer Share from June to October and/or the Winter Share from November to February. CSA’s work by providing the farmer with a reasonable & reliable income source and the ability to plan how much to grow based on the number of members, and in turn provides shareholders with reasonably priced, delicious, abundant, fresh, and in our case, certified organic produce. 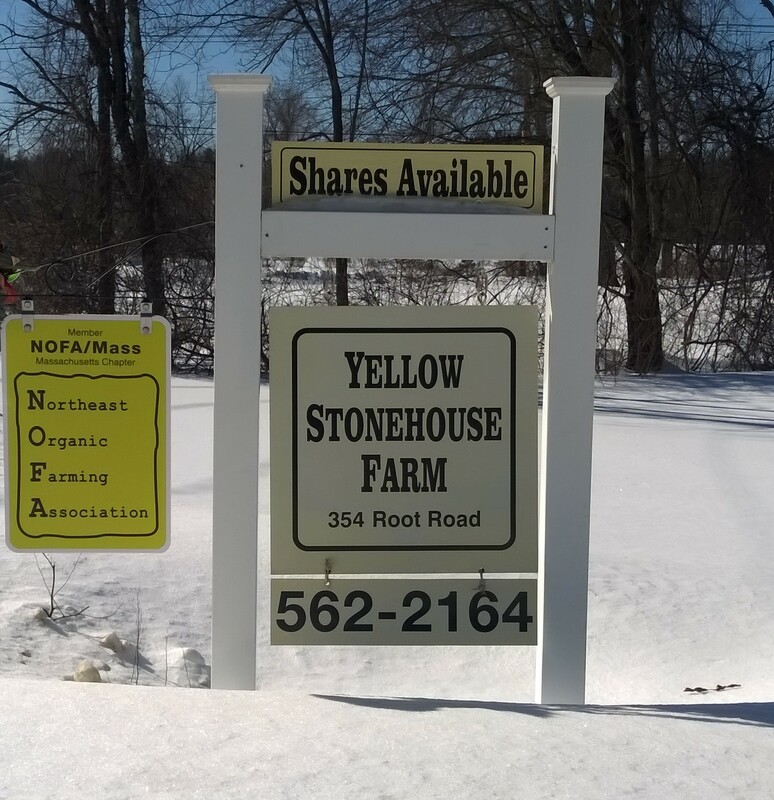 Yellow Stonehouse Farm is Hamden County’s only USDA Certified organic CSA and has a growing membership in Westfield and the surrounding area in the Pioneer Valley. An organic CSA is our way to keep Yellow Stonehouse Farm an agricultural property so we don’t have to cash it in for commercial development. We also are more resistant to drought, pests, and diseases and importantly, we aren’t afraid of poisoning ourselves, the local flora and fauna, or our shareholders with pesticides and harmful chemicals. Kids picking cherry tomatoes can sample them off the vine in the field without worry! There are other less tangible benefits of CSAs. First, many of our shareholders have children and we are exposing those children to the farm, our joy in sustainable farming, and the glories of nature. Maybe we can inspire a child or two to consider farming as a future career. Second, we are working hard to establish the farm as a self-sustaining business. Capable of earning enough income to support a farm family – so that someday, we can sell the farm to a new farm family and make sure the farm stays a farm. 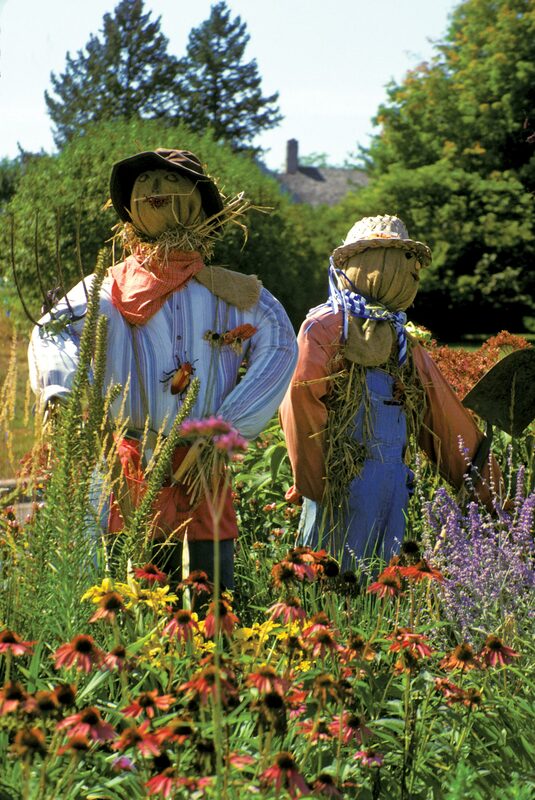 In the meantime, maybe one of our trick-or-treaters will come dressed up as a farmer.